Athletes in wheelchairs are experts at adapting. Now they’re joining CrossFit affiliates in growing numbers. Chris Stoutenberg fractured three thoracic vertebrae falling from his friend’s balcony on June 18, 1997. Paralyzed from the waist down, “Stouty” woke up with metal rods in his spine and a huge hole in his life: Sports, at which he’d always excelled, seemed gone forever. He was 19. Despite the injury, Stoutenberg fought to recover, copying the exercises of more “advanced” rehabilitation patients he saw in his therapy sessions. By September 1997, he was back in school. After a year at the University of Guelph, he was offered a Division 1 scholarship for wheelchair basketball at the University of Illinois, where he played for three years. He won a gold medal at the 2000 Paralympic Games in Sydney, Australia, on the Canadian Men’s National Team, and another in 2004 in Athens, Greece. In March 2012, Stoutenberg’s cousin told him about CrossFit. That led him to Ontario’s CrossFit Indestri. Over time, his coaches began posting videos of his workouts to YouTube. In short order, CrossFit found Stouty. Paraplegic athletes from around the world began seeking his advice. 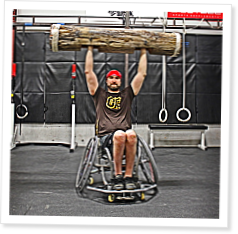 In turn, CrossFit created a chance for these athletes to regain their strength, enjoy therapy more and compete. It’s a sharp contrast to many rehabilitation programs for the newly injured in which therapists don’t challenge their patients. New research at Duke University is studying how exercise might be used during and after cancer treatment.